Looking at the map roughly 8,754 times prior to the trip did not stop me from missing the most important turn leading to the Alla Dimora Lucense hotel. We circled for a little bit trying to get back to the hotel but to no avail, so I just had no choice but park on the street 200 meters away from our hotel. Oh well, out of the gates and back to the same gate we came from and this time I knew exactly where to turn. After showing Ester how an American backs into an Italian garage with minimum sweat, off we go with some major eating, I’m talking about 5 meals sight seeing. I just took a moment to think about how to best describe Lucca and I’m having a hard time. Its either indescribable or the show I’m currently watching (chopped) is interfering with my writing. (Mrs Ziggy if you reading: I think its time for me to get an office now that my blogging career is taking off. I highly doubt Katie Parla is writing posts from a noisy living room. And we are out of Halva). 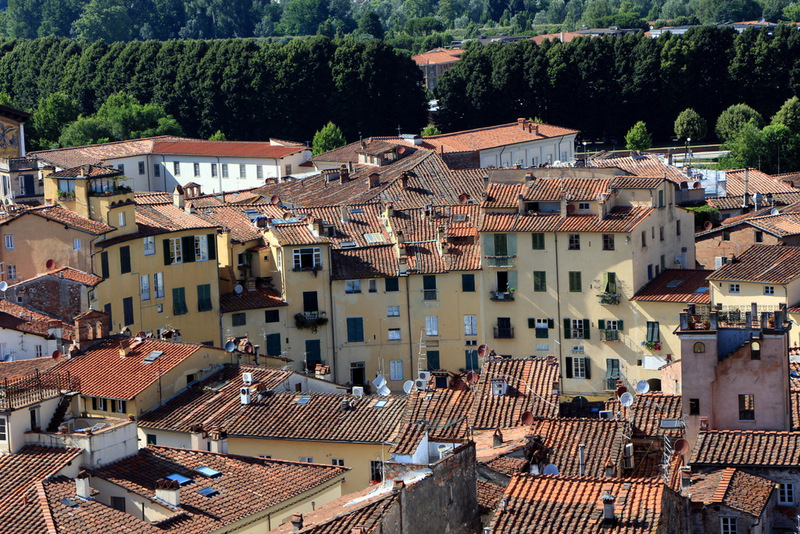 But Lucca is unique, and being in Lucca just felt different to me in ways I cant quite explain. 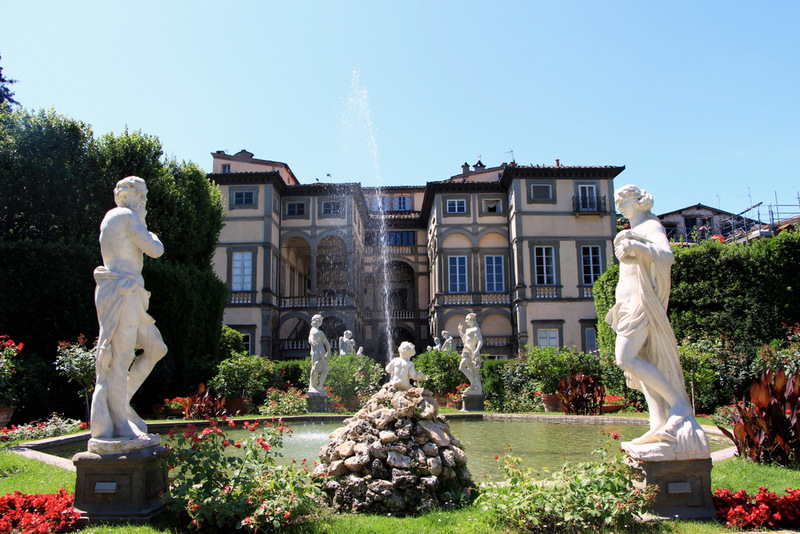 First stop: Palazzo Pfanner and its lovely garden right by our hotel. We really enjoyed this place and spent a bit too much time here, mostly taking roughly 100 pictures of ourselves jumping from a bench. I would show you my shots but its NSFW. 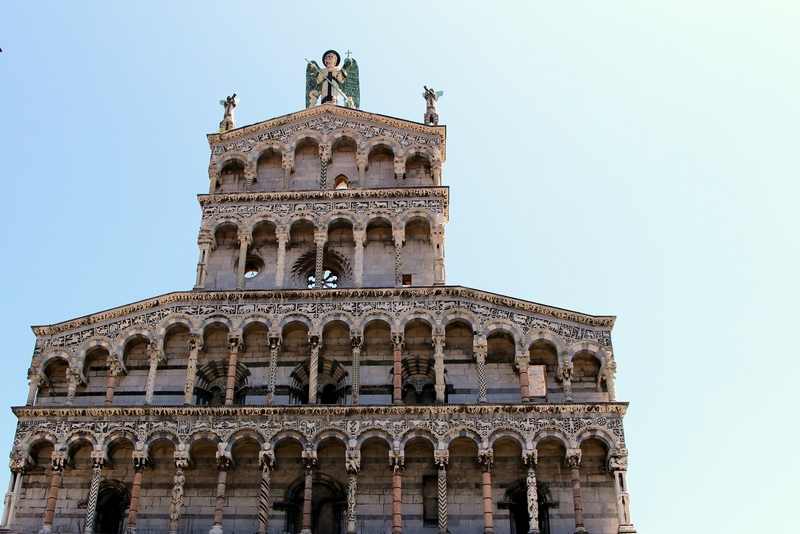 Instead of having the customary 2 meals in Lucca I chose to snack around during the day. We wound up going to 2 particular places 4 times (2 each). 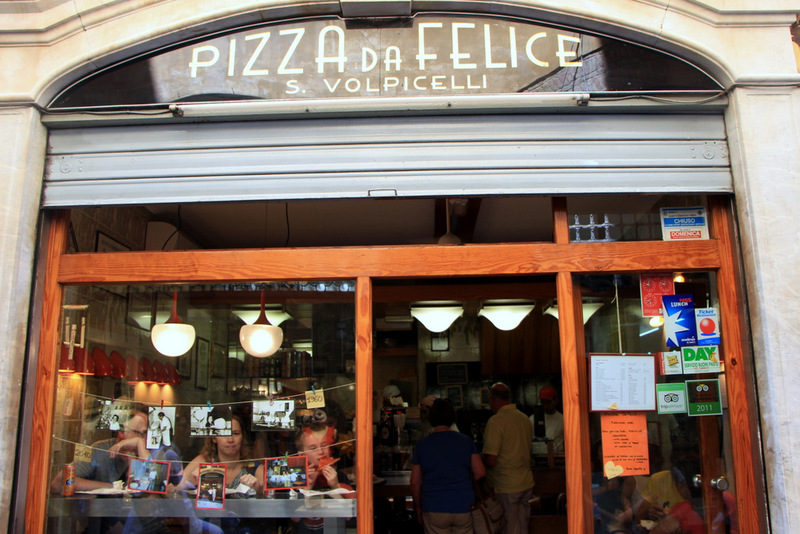 Da Felice is the oldest Pizza in town, and the the most popular with locals. We sampled some delicious pizza with salami, and another one with prosciutto that blended nicely with the rest of the ingredients. But to be honest, I wasnt there for the pizza. 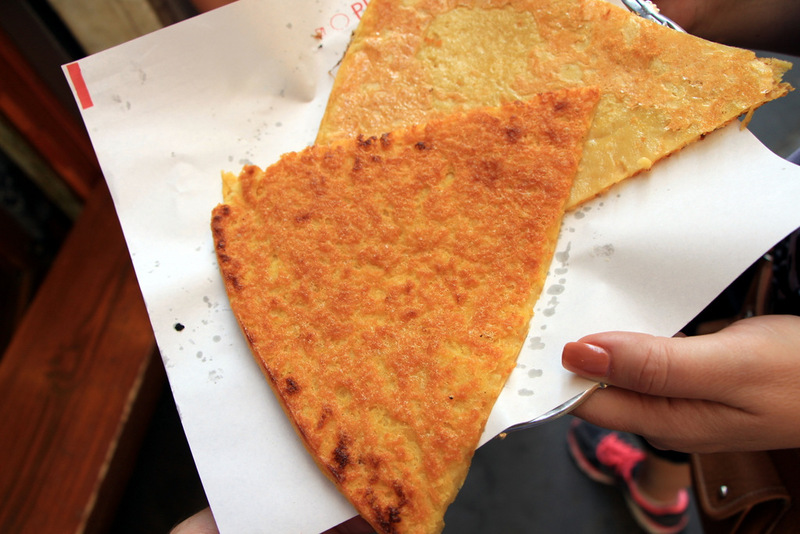 I came for the Cecina, thin pancake like or crepe if you will made of chickpea flour. But since they were down to the last few slices I opted to come back later for a fresh batch. 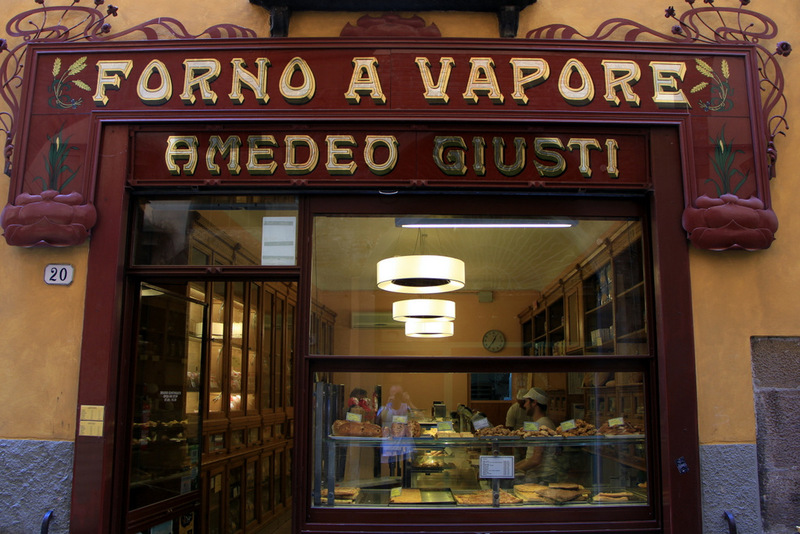 And around the corner is another local favorite, Forno Giusti. The smells alone in this bakery worth going in. People love candle scents, perfume, etc, while I feel at home inside a bakery like this. 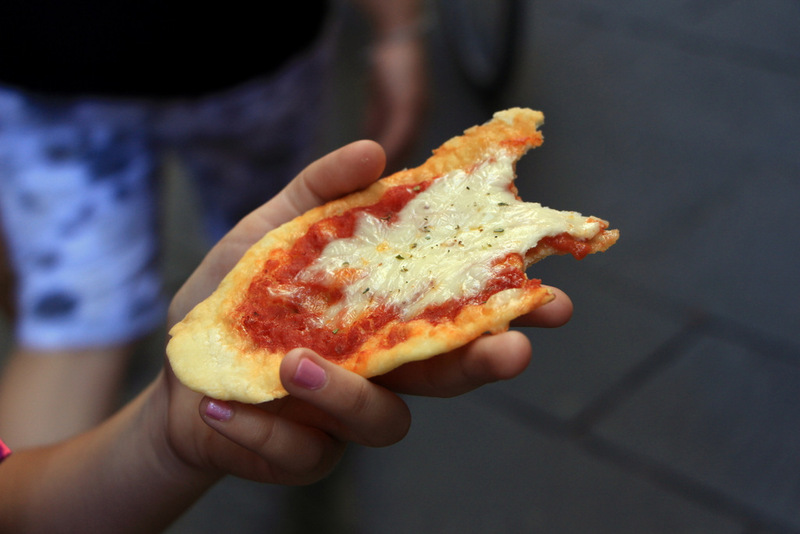 We sampled some focaccia (plain and with cheese) and Buccellato, a simple sweet sticky cake with raisins. But everything else including the fine looking focaccia sandwiches looked amazing. 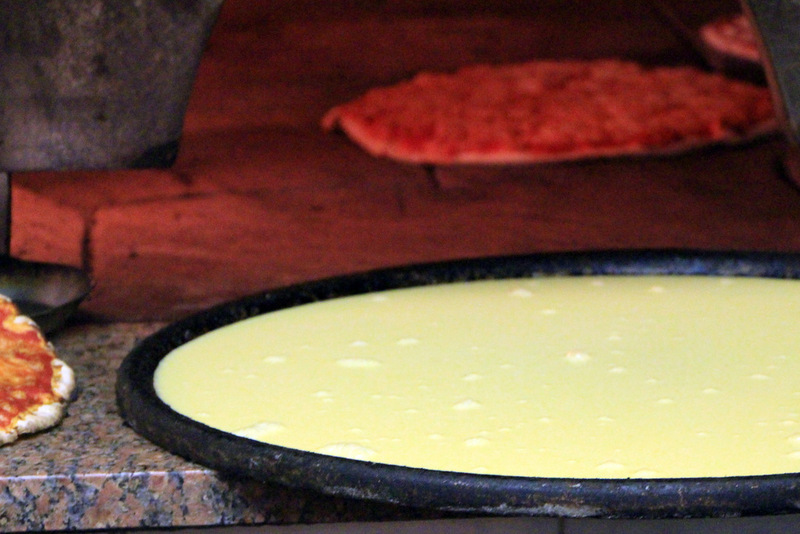 By the end of the trip “Forno” became my new favorite Italian word. Surpassing Tartufo and Finocchiona. 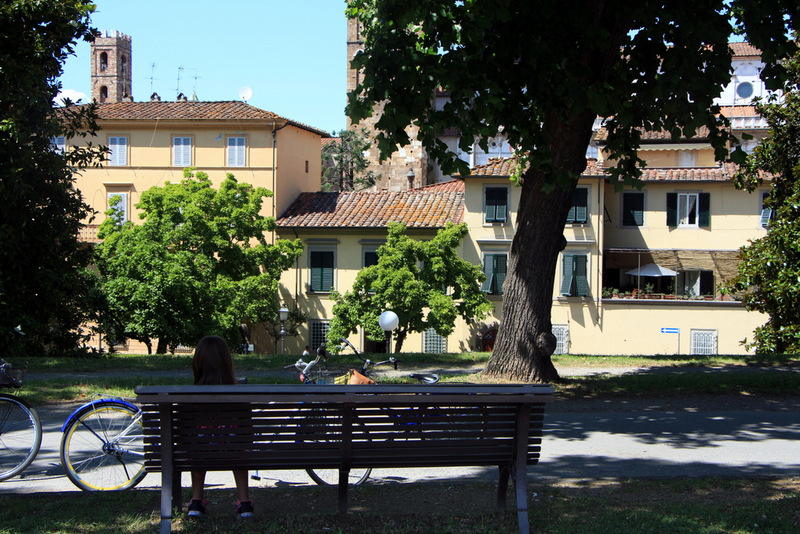 Right near San Michele is a little square that is all about Lucca’s claim to fame, Puccini. The composer’s house which is now a small museum, and a statue dominate the square. We then proceeded with a little bit of shopping. By shopping I mean the girls went inside a large store while I waited outside with other annoyed husbands. They were inside long enough for me to get invited to a Bat Mitsvah in Israel. Internet connection issues limited my ability to explain to the family some of the sites. I was relying on some websites I had saved but couldn’t open them. So in order to make it interesting for the kids I had to invent things. 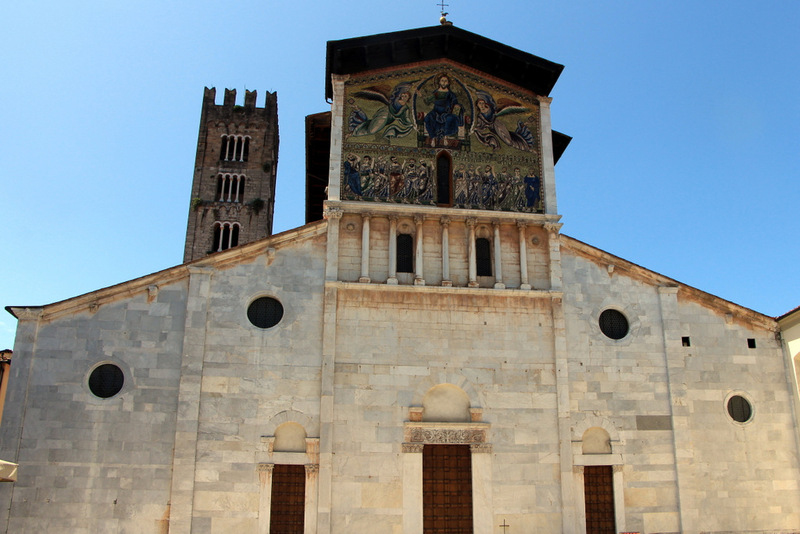 After a short rest it was time to take advantage of Lucca’s main attraction. 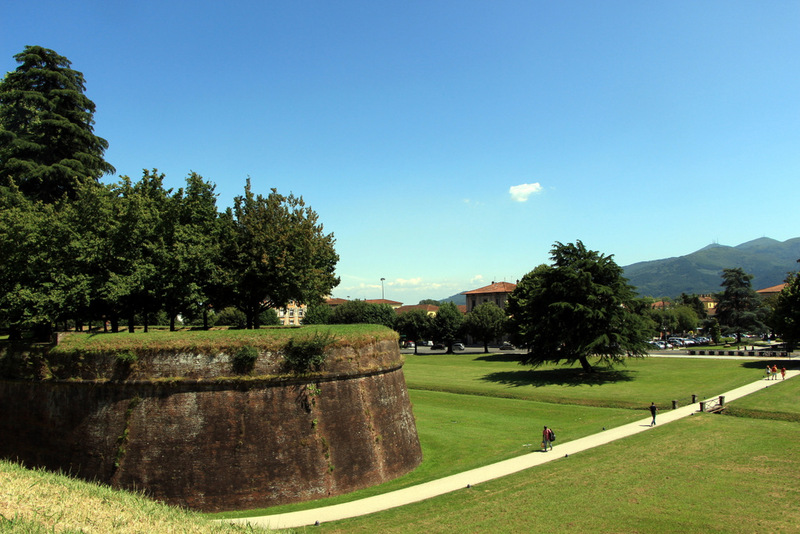 The one of a kind Lucca walls, a 4 km park encircling around the old town. 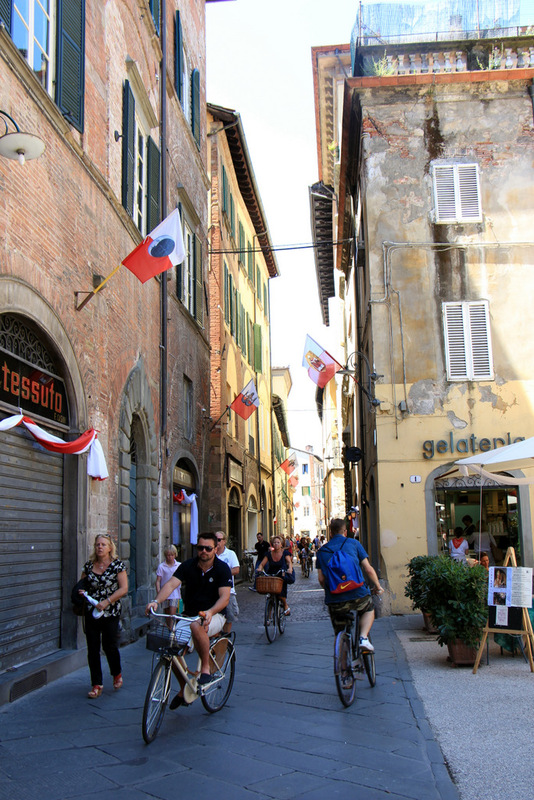 We picked up the bikes in Piazza Santa Maria but there are bike rentals all over town. Some of them I pointed on the map below. We simply had a blast biking all the way around. And to truly appreciate this scenic town biking around it is the way to go. 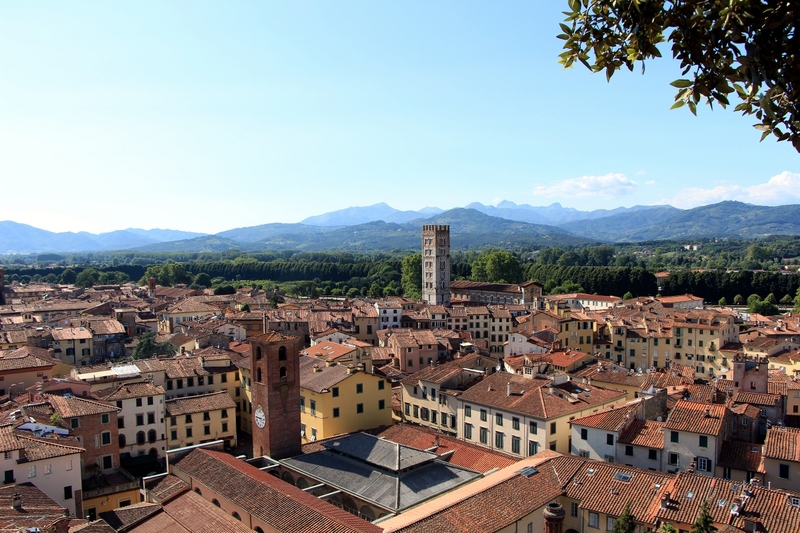 Dont forget to look outside of the walls for more views, and to go down occasionally to visit other areas of the old town and some gelato of course. After another short break we went on to climb Guinigi Tower, one of numerous towers all over Tuscany built by wealthy families to either symbolize wealth or for protection (the towers of San Gimignano). Again, I have to use the word unique here as on the top of the tower you find shade in 2 oak trees, with plenty of breathtaking views to go around. No wonder John Lenin found refuge here as a small child. At this point most of the tourists are gone and walking around is a little more pleasant, although you dont mind the tourists here so much. I couldnt help but notice the Lucca dogs dont stop to poop but do it while walking. Possibly foreign dogs walking around marveling at the architecture while their owners desperately trying to clean their mess. I almost felt like grabbing a few napkins to help this poor woman. Almost! On the way to dinner we bumped into a lovely couple I met on Trip Advisor. 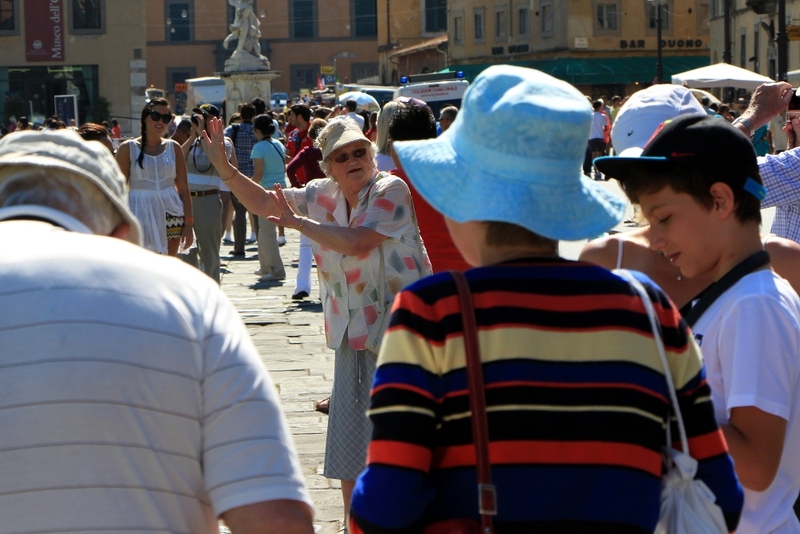 They drive to Lucca every year from England and stay for a while. It was very cool meeting them. 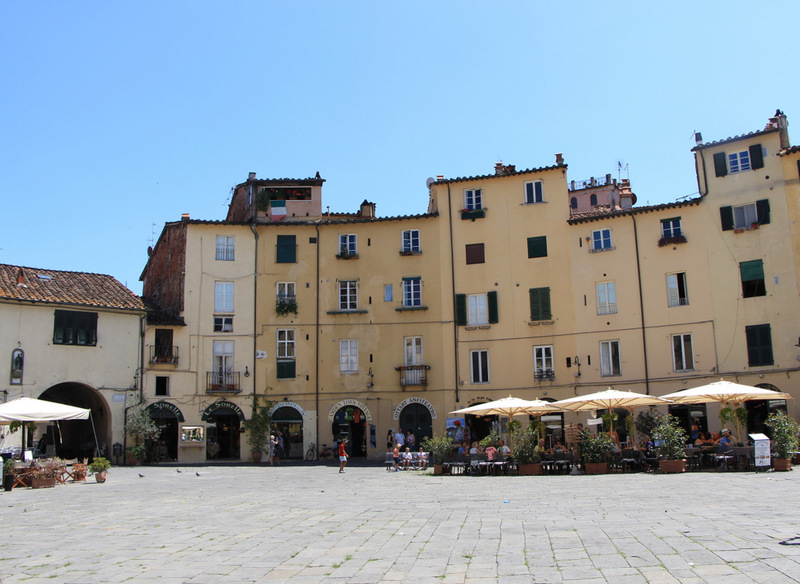 One benefit of staying in Lucca overnight is visiting Piazza Anfiteatro during the day and night. The site of a former Amphitheater holding 10,000 spectators. And of course the site of John Lenin’s eventual execution for giving away Chianina secrets to the Florentines, as I explained to the family. 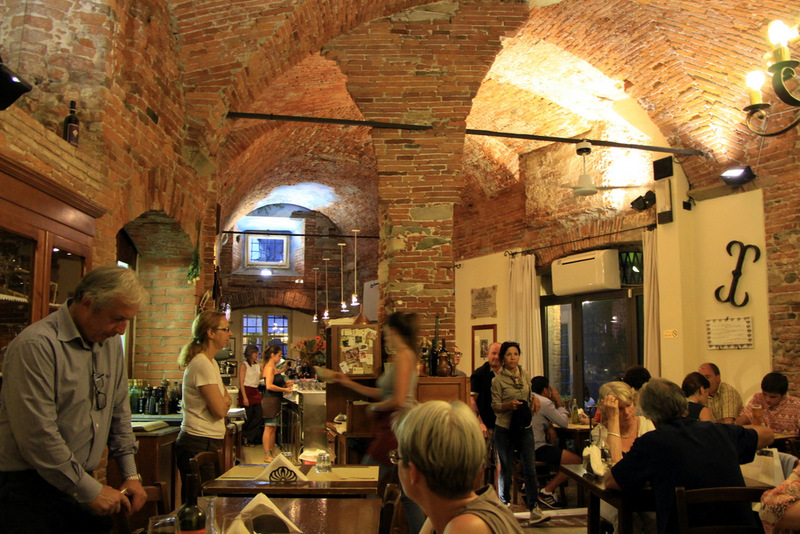 For dinner I chose a place called Baralla and was very pleased with the meal overall. 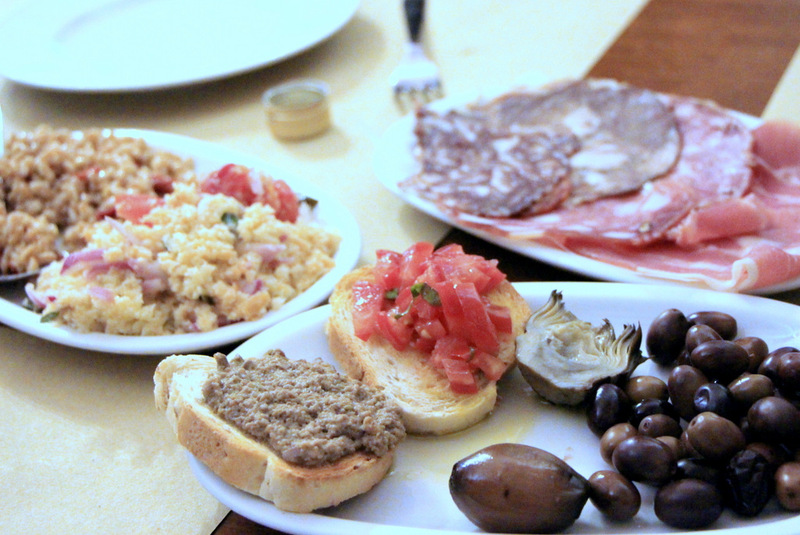 A fantastic antipasti including a very different Sopressata, farro with sundried tomatoes, bread soaked with vinegar and onion and basil which tasted much better than it sounds. I got spoiled with all the Tuscan spoiled bread specialties. Loved the pastas here. 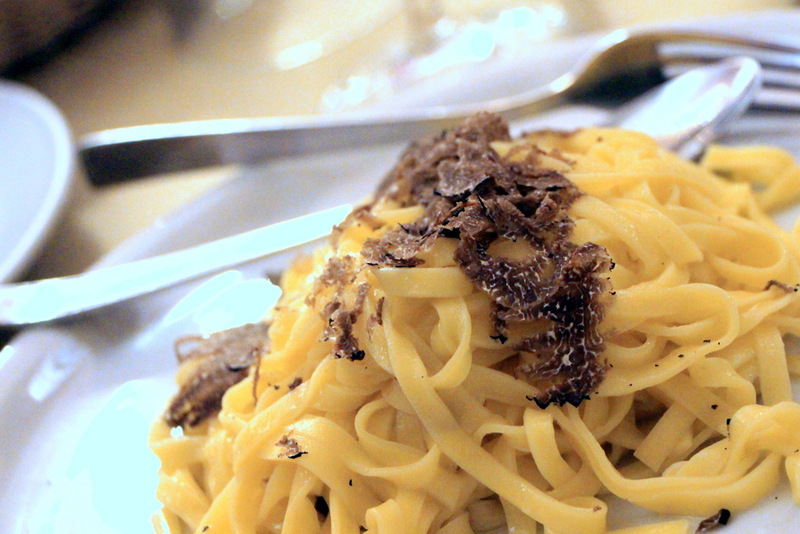 Seeing truffles on the menu finally was like seeing David. These were black truffles from San Miniato shaved on tagliolini and although summer black truffles arent the best quality every little piece counted big time especially now that the entire family is into them. 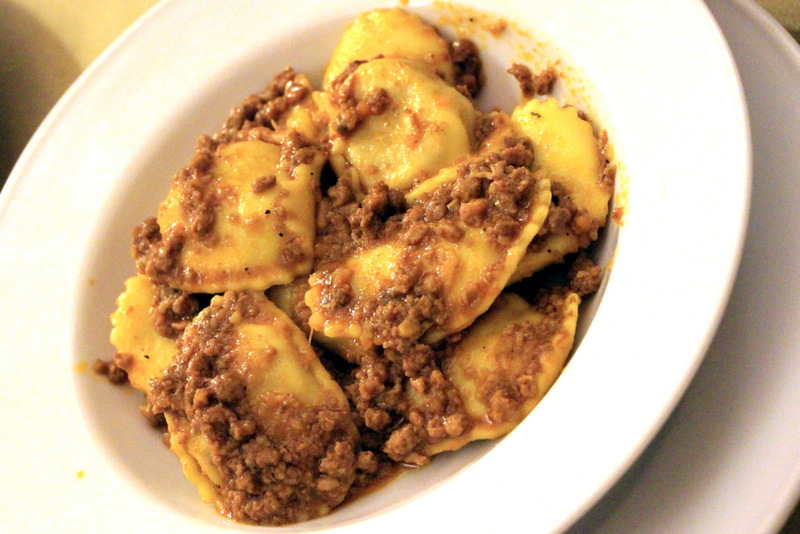 And of course I had to try the Tortelli Luchese which reminded me of Russian Siberian pilmeni stuffed with mystery meat with a meat ragu on top. Really enjoyed this one. 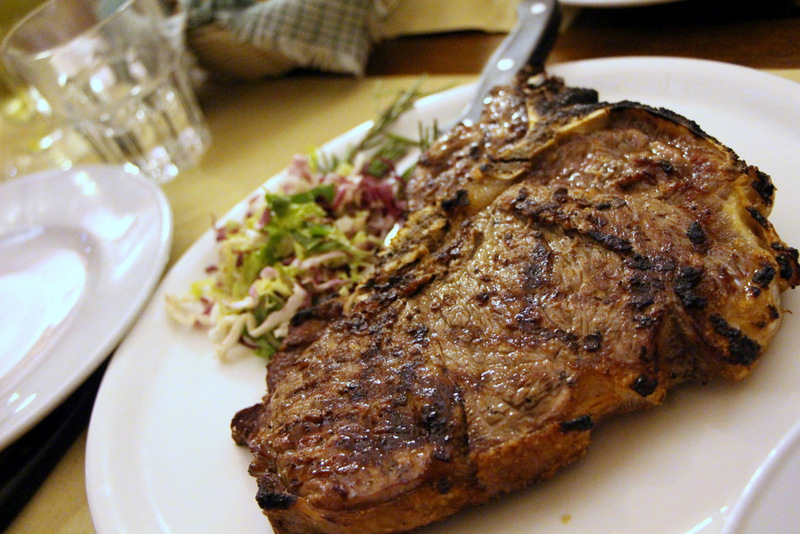 The Bistecca Di Chianina was surprisingly a little overcooked (more like medium) which I didnt think was possible in Italy. 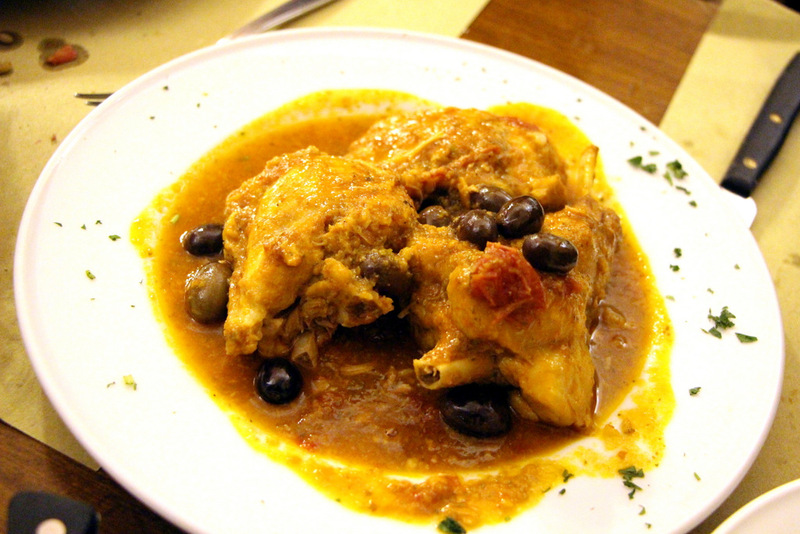 The rabbit cacciatora was more like it. Tender and flavorful. Good tiramisu and a fantastic parfait with pistachios and dark chocolate capped a fine meal overall. 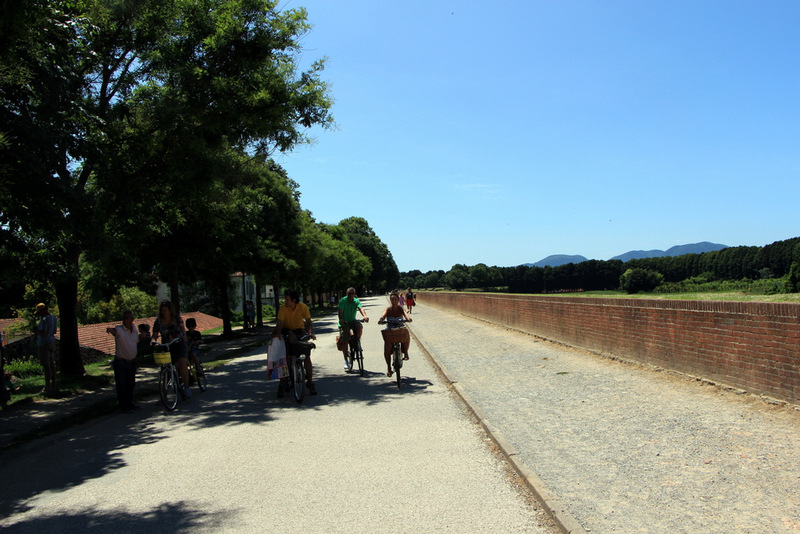 As we were saying our goodbyes to Lucca it was time to say our hellos to… Lucca. We expected this moment to happen as we’ve seen it happen to all our friends numerous times, sometimes even digging through the trash cans outside with gloves. But we never expected it to happen in a foreign country. My oldest forgot her retainer inside a napkin over breakfast and so we had come back. Basically just delaying my next anxious moment: Taking pictures of people trying to straighten the tower of Pisa. Fantastic- take us with you next time! 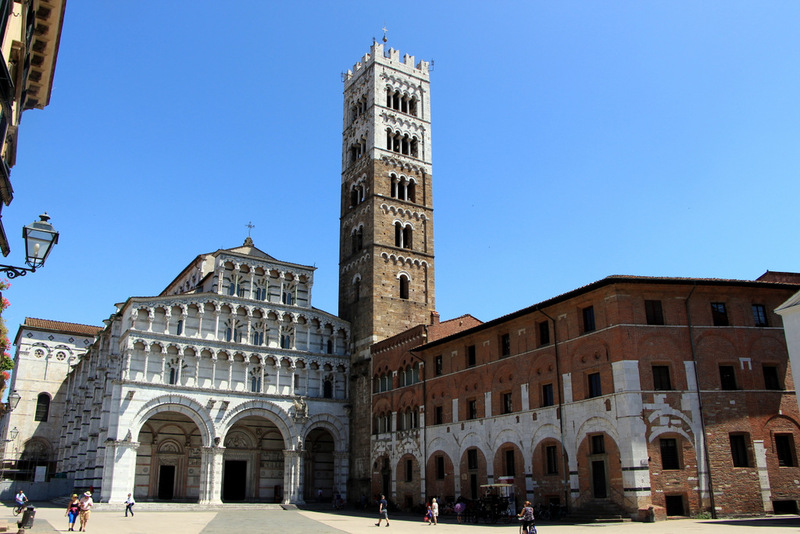 Great Lucca post! I did not recommend Baralla to you but did go there myself on this recent trip and loved my meal-would definitely go back again.